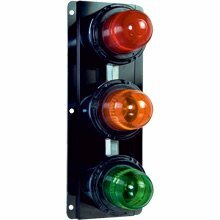 These Status Lights have been designed for use in potentially explosive atmospheres and harsh environmental conditions. The indicators are suitable for use offshore or onshore, where a high degree of corrosion resistance is required. The housings are manufactured from a UV stable, glass reinforced polyester (GRP) fitted to a stainless steel mounting plate for ease of installation. Stainless steel fixings are also used, ensuring a corrosion free product. Units can be supplied as 2, 3 or 4 way in any combination of xenon beacon, LED beacon or filament lamp. Entries Up to 2x M20 or M25. Various flash rates available for LED/xenon units.